I couldn't resist showing you what I've been working on today. I'd forgotten how much fun it is to decorate with a little one in the house. My three year old grandson has just oohed and aahed over every sparkly thing that comes out of a tote. Now he's convinced it's Christmas at our house! There is so much more to do but I am having so much fun, it is most certainly worth the effort. Be back soon to share the whole mantel and more. glad you have a little grandson to enjoy the season with! How sweet. I haven't even started yet. 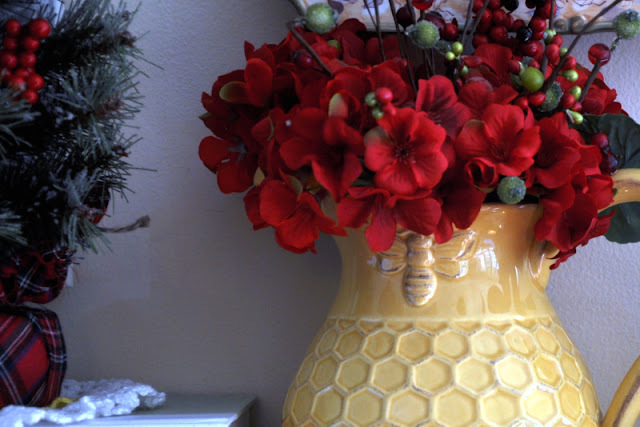 I love the yellow bee pitcher. I have seen that somewhere else before. Love it. Your mantle is looking merry and bright so far! Can't wait to start my up. Got side tracked today...Hopefully tomorrow will get it done! I adore that gold pitcher! It's breath taking! 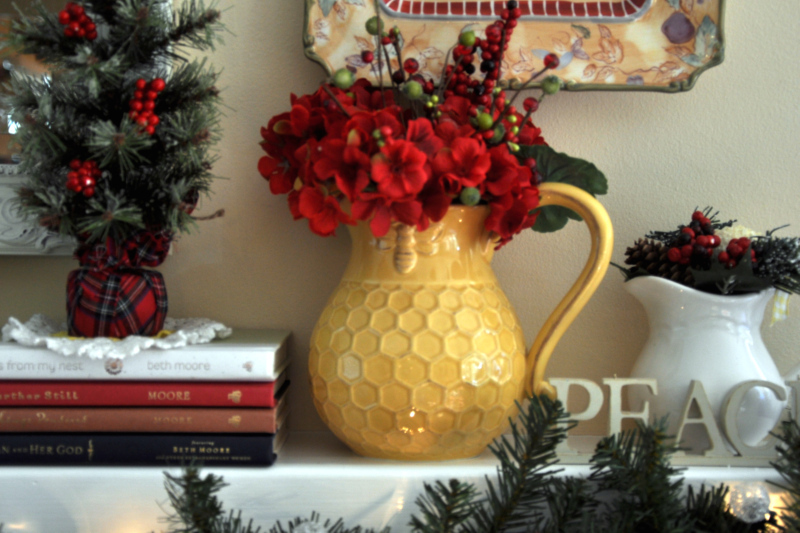 Your mantle is so festive. Looking forward to seeing the rest of your decorations. It's beginning to look a lot like Christmas at your house!! Guess what my eyes were drawn to? Love that bee pitcher! So glad to see you are getting started on the festivities. Well, I'm oohing and aahing, too! What fun! 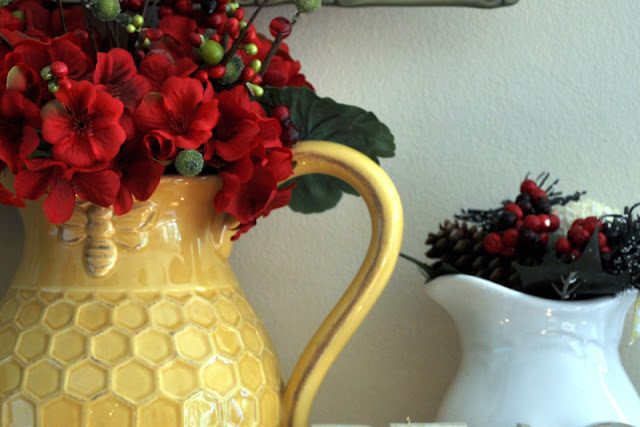 Love that yellow pitcher with red flowers!! I love that color combo!!!! Have fun! So precious, Patty, can't wait to see more! The yellow pitcher is just yummy. Your mantel is looking beautiful! I love it all! Have a wonderful week ahead. Glad you're having fun! 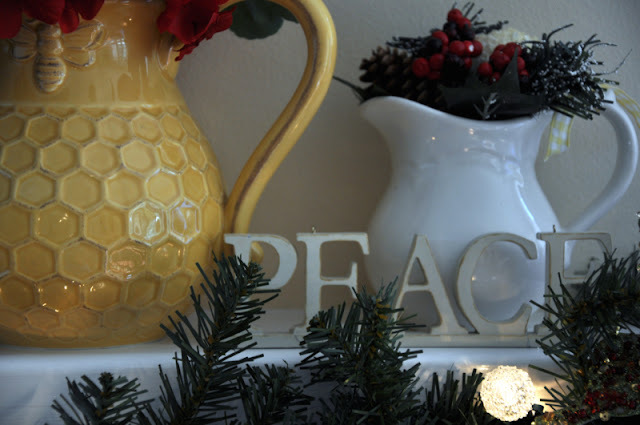 I love decorating the house and revisiting all those fun, sparkly items! Awww ... kids make everything so special. I love their enthusiasm. I can tell it's going to be gorgeous around your place. Very pretty. I love these colors! It is looking very Christmas at your house :) I'm with your little guy with the excitement of your decorating!